The major green building rating system, LEED, isn’t growing. In fact, the green building revolution has stalled, and there are no easy solutions are in sight. 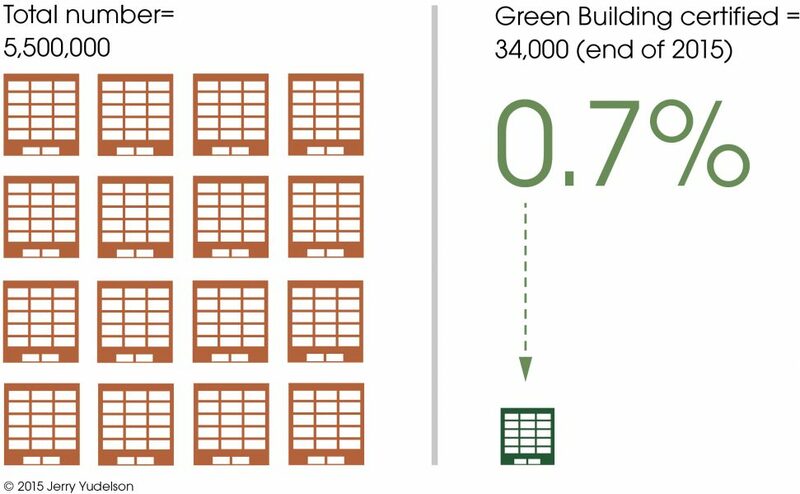 By 2015, LEED had certified less than one per cent of commercial buildings and homes in the U.S. during its first 15 years, and the situation in Canada is not much different (applying the Canadian “10 per cent factor” to compare with U.S. LEED registrations and certifications on a per-capita basis yields just about the same trends overall as in the U.S.). Annual project registrations and certifications for LEED in the U.S. are now fewer in number in 2015 than in 2010. It’s time for a green building program that works for “the other 99 per cent” and that has significant annual growth. The total project certifications at year-end 2015 amounted to less than one per cent of the non-residential building stock (as reported in the LEED Project Directory as of October 31, 2015). In the residential sphere, the fraction was considerably less. We need a new way to rate buildings for their climate and environmental impacts. As the leading green building organization and largest rating system in world, the U.S. Green Building Council and LEED have a special responsibility to engage in self-criticism and continuous improvement. That LEED is broken is not news. Randy Udall and Auden Schendler first raised the issue in 2005 with a provocative article titled “LEED is Broken – Let’s Fix It” on igreenbuild.com. At the time, many LEED advocates, including myself, dismissed issues raised by this article as reflecting growing pains for the LEED system. At the time, LEED was barely five years old and just getting started on the road to dominating the U.S. market for commercial green buildings. But their five main objections—LEED is too costly; project teams are too focused on gaining points and not on results that matter’ LEED’s energy modeling is fiendishly difficult; LEED’s bureaucracy is crippling; and LEED’s advocates continually produce overblown benefit claims—remain drawbacks today. Most experienced green building professionals would also agree that these same issues remain relevant in 2015. But there is a larger problem: green building rating systems have diverged greatly from building owners’ and operators’ core concerns, as these systems are designed to meet the needs of green idealists more than those of most market participants. Green building advocates must abandon the approach they have taken for the past 25 years, which includes comprehensive and overly technical criteria; multiple elaborate rating systems; large and cumbersome bureaucracies; and high costs and inadequate focus on real long-term building performance. Instead, they need to embrace the technological revolution that has cut costs for communications by factors of not ten, not one hundred, but a thousand or more in the past 15 years. Moore’s Law, first enunciated in 1965, says that computing power doubles every 18 months. Over time, unit costs for computing have fallen in a similar fashion. Consider this: every six years, it is 16 times cheaper (and faster) to do the same task; every nine years, 64 times cheaper; every 15 years, 1,024 times cheaper (or 16 x 64); and so on. With the advent of mobile communications, social networks, the Internet of Things, big data analytics, cloud computing and global information systems, why should green building still be governed by concepts, systems and procedures developed in the Dark Ages of the Internet in the 1990s? Sustainable: both in focusing on absolute performance as the best means for addressing climate change, and in accelerating building design and management’s movement onto cloud-based platforms. Until we build most new buildings and retrofit most existing buildings according to dramatically higher standards for energy, carbon, water, waste generation and recycling, then all other considerations are window dressing. After all, Nature doesn’t care how much we reduce annual carbon emissions from unsustainably high levels. Nature only cares about absolute levels of carbon dioxide (and other greenhouse gases) in the atmosphere, about excessive water use that damages natural ecosystems and about waste that doesn’t get recycled into something else. It turns out that the solution is already staring us in the face: the technological revolution that has given us the mobile Internet, social media and Big Data analytics. With this revolution, we can start with the user’s concerns and work toward creating a rating system (or systems) that enhances the user’s experience. Here’s an example in one word: Uber. In 2015, just five years after it started, Uber’s latest financing round valued it at $50 billion. What did Uber do? It took on a hundred-year-old urban transportation system—taxicabs—and created an easy-to-use smartphone app that revolutionized it, in the process challenging and upending a highly regulated, low-user-satisfaction industry. No one likes taxis, but if you land at any airport or stand on any street corner in any large city, they’re usually the only curb-to-door service available. What don’t we like about taxis? They’re not always available when and where you want them; they’re hard to get during rush hour, rainstorms and at dinnertime; they are often dirty and uncomfortable; they are prone to occasional customer rip-offs; and they may not accept credit cards for payment. The taxi business’ main beneficiaries are taxicab owners, not customers or even drivers. Uber started with the idea that a ride-for-hire service could address these issues, utilize surplus labor and vehicles, enhance customer experiences and be profitable for all concerned—by using the phone we already carry in our pockets. Brilliant! I’ve used Uber’s smartphone app many times: I can track where the driver is at all times; I know I’m going to get a clean and comfortable car with a driver who knows the town; and I’ve already paid the fare and tip when I step into the vehicle. Uber is so disruptive that it has encountered stiff opposition from everyone profiting from the current system, including “progressive” politicians who are in hock to taxicab owners for campaign contributions, but it will succeed because it’s focused on creating a superb user experience. According to the New York Times, nearly two million New York City residents have already downloaded the Uber app. Green building certification is ripe for the same disruptive treatment, but it’s supremely unlikely that established organizations can or will upend their current revenue models to provide a far more user-friendly approach. 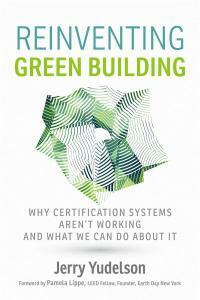 It’s time for new organizations and fresh thinking in green building. It’s time to leave behind the current monastic, hair-shirt experience of LEED certification and create a fabulous user experience. It’s time to Uber green building. I have been moved by the green building community’s action in the face of climate change. Green heroes acted even while climate change science was being treated as an oxymoron, and they railed against those who continued to bury their heads in the sand in avoidance of fearsome truths. I don’t think we considered that we might ever be doing the same. Yet, in reading Jerry Yudelson’s stunning new book, Reinventing Green Building, I became deeply saddened by all he clarified. In the past several years, there has been unease at the slow pace of green building uptake, of certification system evolution, and of cost barrier removal. Using clear writing, convincing tables and crisp chapters, Jerry exposes the collective market failure: green building certification systems have not achieved their own market penetration expectations: instead of the 25 percent green buildings that were targeted, green building sectors have achieved 1 percent penetration. Worse, we are not on a trajectory to achieve the necessary reductions in greenhouse gas emissions to address climate change in the built environment as quickly as we need to. Jerry’s book is like The Emperor’s New Clothes, except it isn’t a fable. Essentially, he explains: how have we done, what are the goals, what challenges exist in achieving them, and what can we do now? We can look at his analysis from an attachment to a particular green building certification system; or to materials with a concern that they are omitted in the new ‘green building’ paradigm that focuses on climate change (for rational reasons). Or, we can take it as a call to action. Isn’t this the time to do so, while there still is time? It took great courage for Jerry to write Reinventing Green Building. Can the green building community step up to utilize it? While I agree that LEED has only touched a fraction over the overall marketplace, I disagree with the numbers presented in the article. Between 2011 and 2015, all Canadian projects were required to be registered under the Canadian Green Building Council’s (CaGBC’s) LEED-Canada rating systems (which were similar to their US counterparts, but with Canadian standards and codes), and were not supposed to register under the USGBC systems unless a specific rating system did not exist in Canada (eg: LEED for Retail). A quick search of the CaGBC project database reveals that between January 1 2011 and December 31 2015, nearly 1,500 projects were registered with the CaGBC, and over 2,000 received certification.